an Ipod docking station . Wow, just returned from this fabulous home which was everything we hoped for, fantastic location close to everything yet quiet and peaceful after an exhausting day at the theme parks. 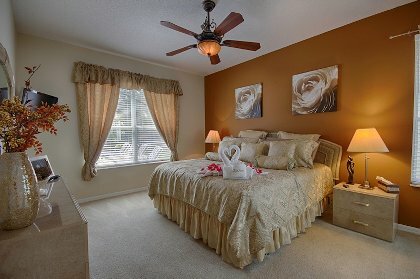 The home is beautifully furnished and the beds are so so comfy. we experienced a cold snap and within 15 minutes of calling the management that we were cold someone was round to show us how to switch from the AC to heat, now thats what I call service. Love the home, you have made so many improvements since our last stay, My nephews loved the pool and the play station it was difficult to get them to leave. We will be in touch as soon as we confirm dates for our next visit. We wanted to let you know how much we enjoyed staying in your home. The pictures do not show it to full advantage it is huge, the pool area is brilliant much larger than any other homes we have stayed in. Thanks for the tip about checking our luggage in at downtown disney, we had never known about this before. We will recommend your home to everyone and will be saving for our next visit. this was our third trip to this home and once agin fantastic, it gets better each time. Elizabeth we loved the new pool finish and flat screen tv's in bedrooms the children never want to leave and are planning our trip for next year already, will be in touch soon for reservation. I've just received feedback from my mates we all agree as a group that was the best two weeks holiday ever. The location of the Villa was first class, Disney World, Sea World, Universal, Kennedy Space Center all within easy reach, as for the Villa "WOW" we couldn't believe how big and spacious it is and so luxurious from teaspoon to fifty inch TV you do not wont for anything. When we weren't playing golf, "we played seven different courses every one was perfect" our days around the pool were just so relaxing, a cold beer and a snack was just a couple of steps away, and the bedrooms, I had the Master bedroom upstairs it was better than any five star hotel I've stayed in. On behalf of the seven of us I would like to thank you for letting us use your Home for our holiday, I will be recommending it to all. If my family and grandchildren can fit it in, "as ARNE would say" Ill be back. Thank you once again for helping seven old guys have a fantastic holiday. My husband has told me all week how good I done finding this home. There is 16 of us all together and enough room for everyone its very nice to come back to a "home" instead of a "hotel" after a tiring day at the parks. Looking forward to doing this again. God Bless You "
This home was outstanding. We have traveled to Florida eight of the last ten years to watch our daughters play college softball. This home was by far the best experience that we have had. We broght the entire family down (10 people) and everyone was more than satisfied. 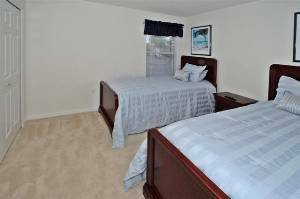 The entire Lake Berkley complex is outstanding from it's secure gated system to access to it's many features. Everything met or exceeded our expectations and ojnly wish we could have stayed for a whole month instead of just seven days. I would highly recommend this home to everyone I know. The savings between putting up ten people individually opposed to as a group was quite a savings too!" We had such a wonderful time in your home. We had a little family reunion with relatives from all over the USA. Your house was perfect and very confortable & very clean. Any problems/issues we may have had where taken care of in lightning time. Your house care taker was wonderful. My grandchildren loved the master bath. They wanted to take a bath all the time. I would definitely recommend this house to my family & friends. The only main down part was that the hot tub wasn't hot. I understand that we'd need to pay to have the pool heated. But I don't understand, if you advertise a hot tub, that the heating isn't included in the price for the house." We all enjoyed our stay at you lovely home and were very sorry to leave. 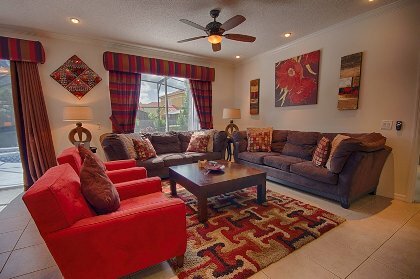 Your home was perfect for us with plenty of space for 3 families and easy access to the theme parks. We especially enjoyed a few drinks by the pool while watching the sun go down"
Visited in September 2006. > > Firstly the resort is a gated community on the Highway 192, just sited behind "Medieval Times" Dinner Show and the 24 hour supermarket "Walmart". Local to all the attractions. Magic Kingdom and all the Disney parks; a 15 min drive away and Universal Studios/ Sea World and International Drive about 20 mins up one straight road. The resort is a collection of Lovely Villas and Newly built townhouses, built around a large lake. There is a Gazeebo which hosts private weddings, a park, tennis courts, two swimming pools and a poolside bar. Also a club house with internet connections, video games and pool tables. > > The Villa itself is out of this world, like a showhouse, I cannot stress how beautiful it is. There are two large living areas and a large kitchen with everything needed, all open plan with a lovely light and airy feel. 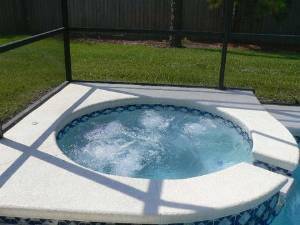 The house is fully air-conditioned and has two double patio doors leading out into the pool area. 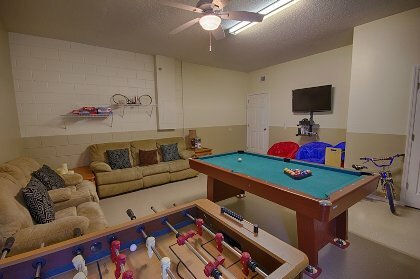 The garage has bee made into a games room with everything needed for the kids and adults alike, Pool table, bikes, strollers, Playstation 2 and poker table, the house has wireless internet connection for laptops which was very handy. Also a utility room with washer and dryer. > > There is a communal bathroom downstairs and also one of the two Master Suites with a large en-suite bathroom and walk in closet, all tastefully decorated. Up stairs are the further six bedrooms and three further bathrooms, all spacious with closets and and unisex colours. Spotlessly clean with hairdryers installed. > > The pool area is massive, with adequate seating and sun loungers for all the guests. 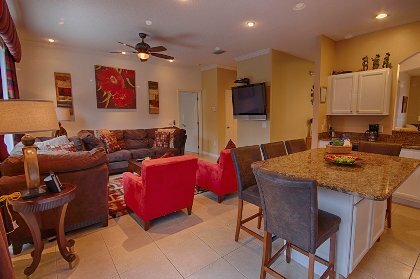 Oversized area around the pool makes all the difference and there is also a barbeque for those warm nights. The pool area gets the sun light all day and evening until it sets. The night time is lovely, no noise from anywhere. > > Our time spent in the "GlistenFloridaVilla.com" was like a taste of paradise where there is room for everyone and room for peace and quiet, we would highly recommend a stay there and after visiting villas in Florida over 20 times, we can say this is the best ever.... Book it! 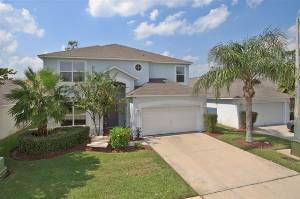 > "
I have had 2 vacation in this home the first being in July 2002 my family and I had a fabulous time the location was excellant and the pool and spa were great to relax in after a long day at the theme parks. We all had such a great time we rebooked for May 2005 and have just returned. It was great to see that your home has been maintained to a very high standard and we particularly like the new furnitue withlazyboy chairs. 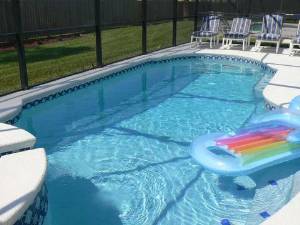 we also noted that the home had been redecorated and liked the colors also all the new pool furniture and the addition of a playstation 2 kept our son occupied whikle we lazed around the pool. The additional personnal touches were also nice . I wanted to let you know how much we enjoyed stay at your home for the 2nd time. our first vacation there was July 2002 and again in May 2005 and we were pleased to see that not only was the villa still as wonderful as before it was even better as you had refurbished and redecorated. We were also delighted to see there was an on site bar at one of the communities clubhouses this was an added bonus. I will be recommending your home to everyone and we hope to be back in another 2 years. Other Fees: cleaning fees only apply to rentals of less than 7 nights.